During the planning stage of our St. Louis trip, we had assembled our preliminary itinerary. A phone conversation with Anthony Paraino from Explore St. Louis shed light on a couple of great attractions we had overlooked. 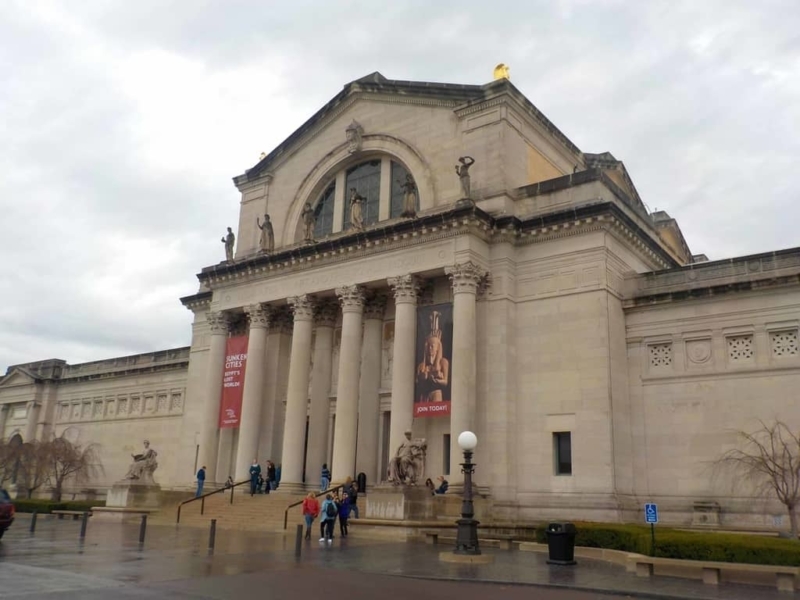 The St. Louis Art Museum was preparing for the launch of a new traveling exhibit. Sunken Cities: Egypt’s Lost Worlds would arrive the week before us. It was destiny that we would get a chance to see it for ourselves. 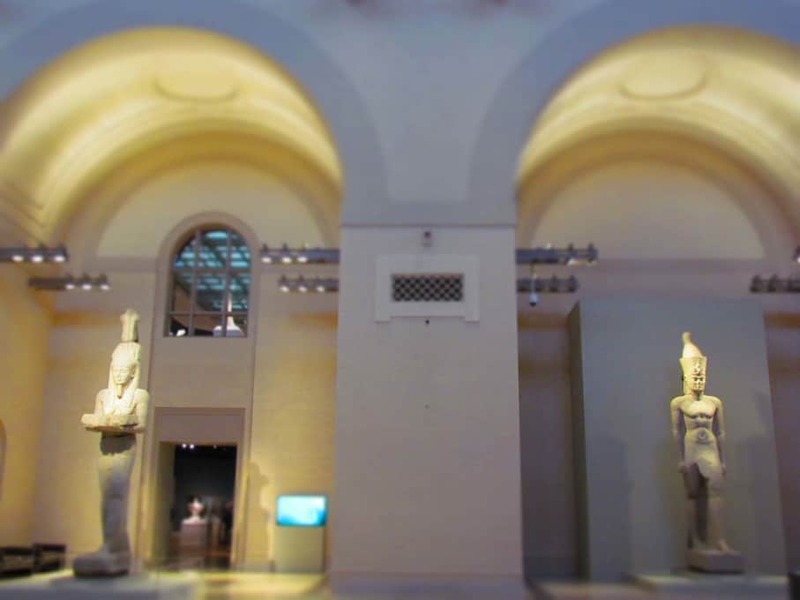 We want to thank the St. Louis Art Museum Museum and Explore St. Louis for their hospitality. Rest assured that all opinions are our own. St. Louis founded its art museum in the late 1800’s, which is around the same period that many large cities were doing the same thing. The original building that housed the museum was on the old Washington University campus. It moved to its current Forest Park home after the 1904 World’s Fair. Built for the fair, the building was originally named the Palace of Fine Arts. A statue of King Louis IX still stands watch over the fairgrounds in front of the museum. We arrived at the museum and checked in to get our ticket for the Sunken Cities exhibit. These are doled out by time slots to limit the number of patrons in the gallery at any one time. Later we would appreciate this detail. With a little time to wait, we decided to check out some of the nearby rooms. 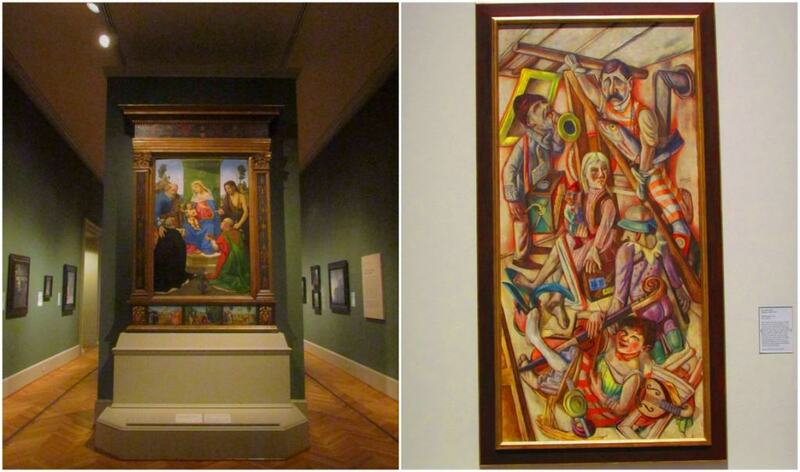 Over the years the St. Louis Art Museum has amassed a collection of over 30,000 pieces of artwork. It has especially strong collections of modern art by European artists. The St. Louis Art Museum is a free attraction, so there was a steady stream of visitors filing in. We passed through a few galleries checking out the various pieces. It was a rainy day, so we guessed it made a perfect outing destination for many of the city’s residents. 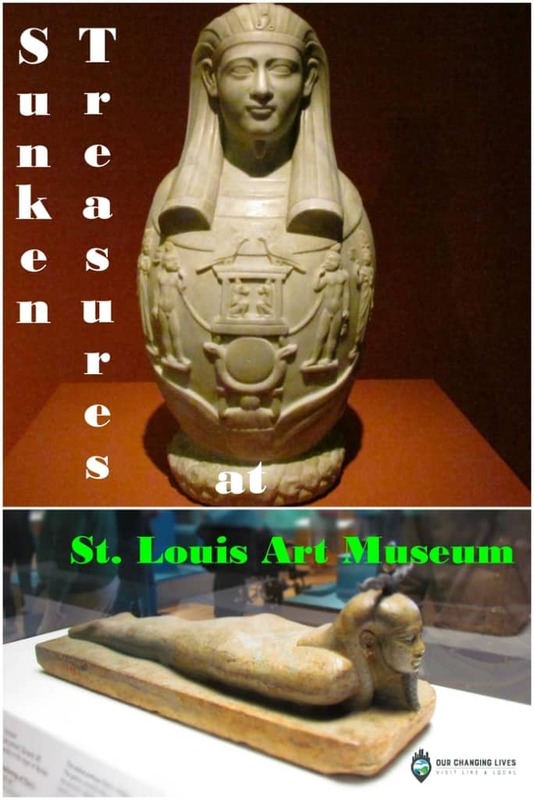 The newly arrived Sunken Cities exhibit is making its first North American stop in St. Louis. A massive amount of artifacts are on display. While most are held in the special exhibit area, there are a trio of pieces that wouldn’t fit. These 16 foot tall statues are housed in a larger gallery, and offer a peek at the wonders we were in for when it was our turn. In this area we found a pharaoh, his queen and the Egyptian deity Hapy. All are carved from pink granite and have been reassembled. The mighty Nile River cuts through the deserts of Egypt, supplying the waters of life to the area. Egypt’s history and destiny are tied to the river. While the mention of Egypt usually conjures images of pyramids and sand, the area where the Nile meets the Mediterranean Sea is especially fertile. Flooding and receding has occurred for centuries and claimed many coastal communities. Such was the case for the coastal port cities of Canopus and Thonis-Heracleion. With only minutes left for our time slot, we made our way back to the exhibit entrance. Before long the announcement was made for our group to enter. We passed into the gallery and were immediately surrounded by the unbelievable collection. The crowds were large, as the time slot before ours was also sold out. The artifacts are spaced out enough to allow viewing from multiple angles, so there was plenty of room for everyone. Informative placards help denote the story behind many of the pieces found in the gallery. The draw of this exhibit is obvious, by noting the wide range of visitors ages. Everyone seemed to be intrigued, as they checked out the artifacts. In one of the rooms a film was running that shows the underwater recovery operation. This is on a loop, so if you come in part way through, you can catch the part you missed after the film finishes. As we inspected each of the pieces, we were amazed to think that they have held up so well after centuries buried in the sea bed. Some look as though they were just created, and the condition is unbelievable. The level of detail in the pieces hints to the knowledge and skills of the artisans who created these artifacts. To be honest, we are not that familiar with ancient Egyptian culture. Visiting the Sunken Cities exhibit gave us an opportunity to learn a little more about some of these ancient people’s beliefs. 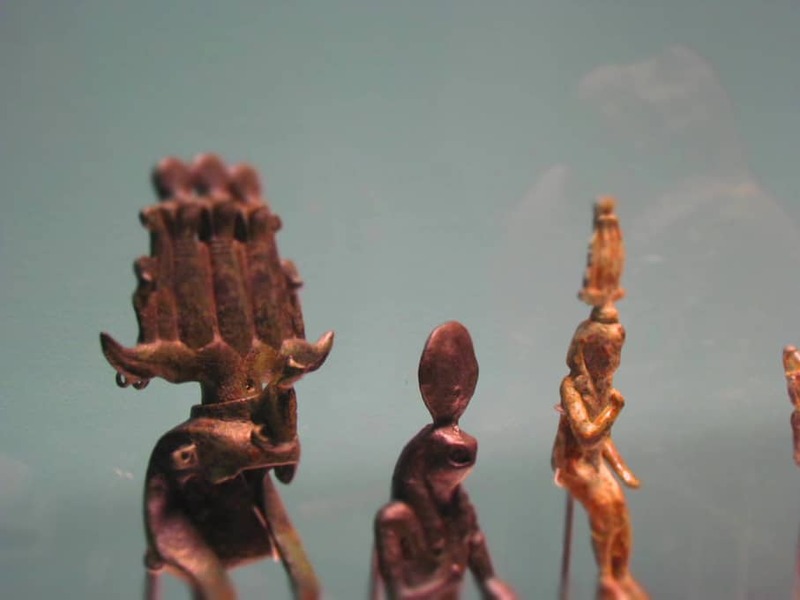 So many of the artifacts on display represent the deities that these people worshiped. 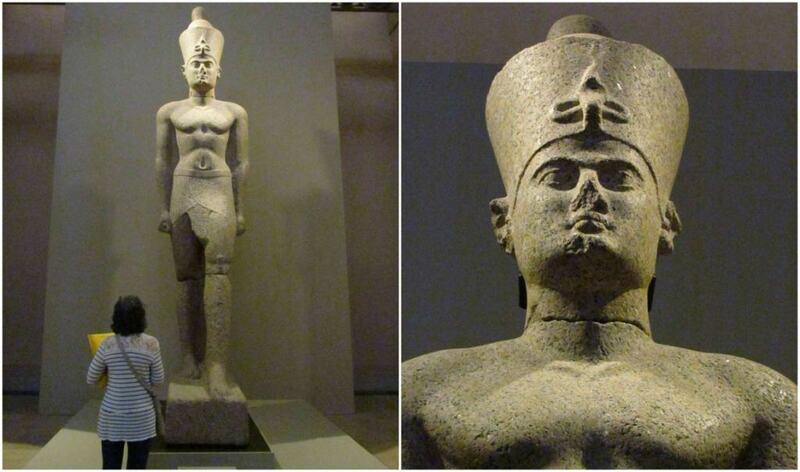 Osiris, who was their god of the afterlife, is prominent in many of the pieces on display. He was associated with granting all life, including the cycles of nature. This would even include the annual flooding of the Nile, which brought a rebirth of vegetation to the areas that had dried out when the waters receded. The collection that travels with the Sunken Cities exhibit is astounding. We have read that it includes over 300 pieces, and that is an easy number to believe. With so many artifacts, it would be futile for us to try to pick our few favorite photos. We decided to include a gallery of shots from our visit to the museum. We hope you enjoy them and it spurs you to visit St. Louis to see these wonders for yourself. The St. Louis Art Museum will host the Sunken Cities exhibit until September 9, 2018. You have an entire summer to witness this spectacle for yourself, before it moves to its next destination. Of course, this exhibit is not the only good reason to visit the museum. Being one of the free attractions in this metropolitan city, you have tons of reasons to plan a trip to St. Louis. The art museum is a wonder on its own, and the site where it resides offers some beautiful vistas to enjoy. We have even heard that many locals will use the hill out front for sledding in the winter. Clearly St. Louis is a “Gateway” to fun. Do you plan to visit this exhibit? We’d love to hear your feedback, so drop a line in the comments section below. Thanks! Enjoy this article? Share it with your friends! Fabulous post! I’m sure I would enjoy a visit to the St. Louis Art Museum. It looks spacious and colourful, and filled with wonders. Thanks for the compliment. We are positive you would enjoy it. I just returned from Egypt and I know what you mean about learning about the gods and goddesses; it’s interesting to know what the ancient Egyptians believed. I would love to see this exhibit at the St. Louis Art Museum! We would love to visit Egypt someday. To see the ancient lands in person would be amazing. I’m so sorry that I missed this museum when I visited St. Louis. I guess I’ll need another trip back. I love that there are so many free museums in St. Louis. We found St. Louis to be one of the most pocketbook friendly cities we have visited.